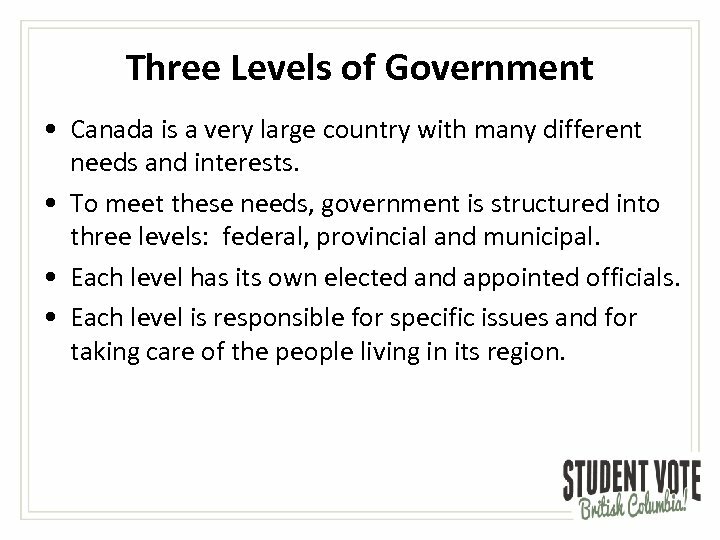 Three Levels of Government • Canada is a very large country with many different needs and interests. 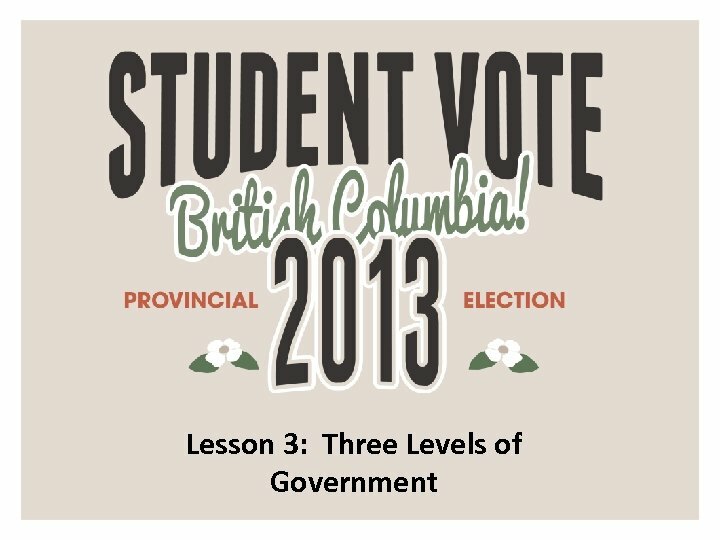 • To meet these needs, government is structured into three levels: federal, provincial and municipal. • Each level has its own elected and appointed officials. • Each level is responsible for specific issues and for taking care of the people living in its region. 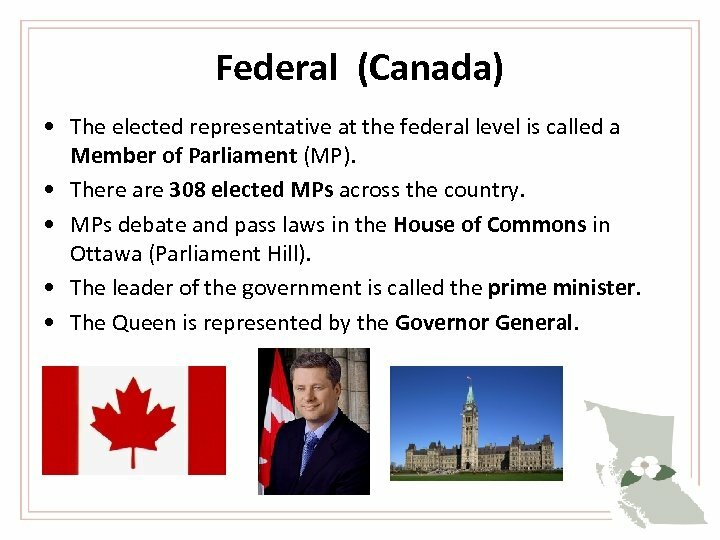 Federal (Canada) • The elected representative at the federal level is called a Member of Parliament (MP). • There are 308 elected MPs across the country. • MPs debate and pass laws in the House of Commons in Ottawa (Parliament Hill). • The leader of the government is called the prime minister. • The Queen is represented by the Governor General. 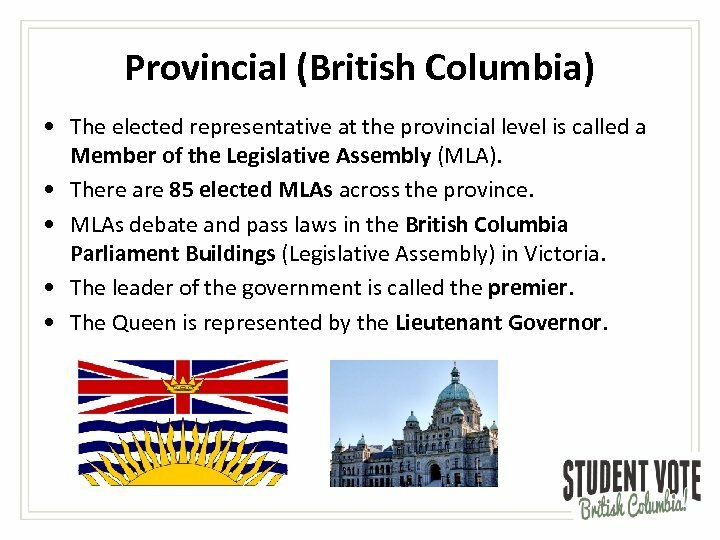 Provincial (British Columbia) • The elected representative at the provincial level is called a Member of the Legislative Assembly (MLA). • There are 85 elected MLAs across the province. • MLAs debate and pass laws in the British Columbia Parliament Buildings (Legislative Assembly) in Victoria. • The leader of the government is called the premier. • The Queen is represented by the Lieutenant Governor. 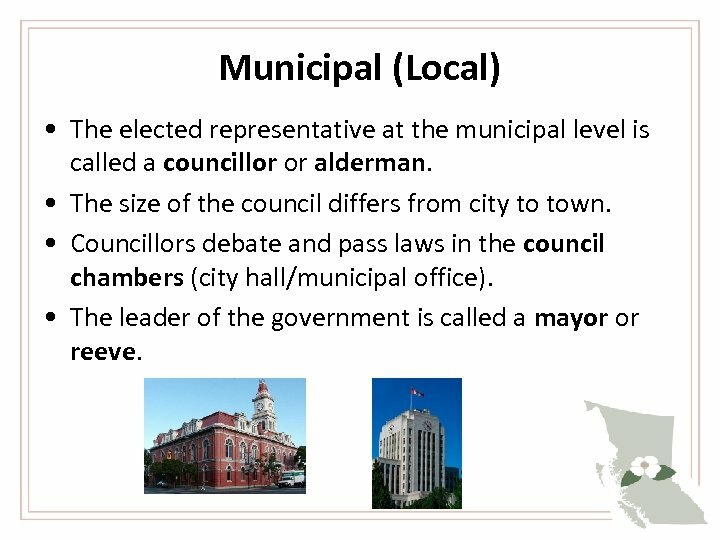 Municipal (Local) • The elected representative at the municipal level is called a councillor or alderman. • The size of the council differs from city to town. • Councillors debate and pass laws in the council chambers (city hall/municipal office). • The leader of the government is called a mayor or reeve. 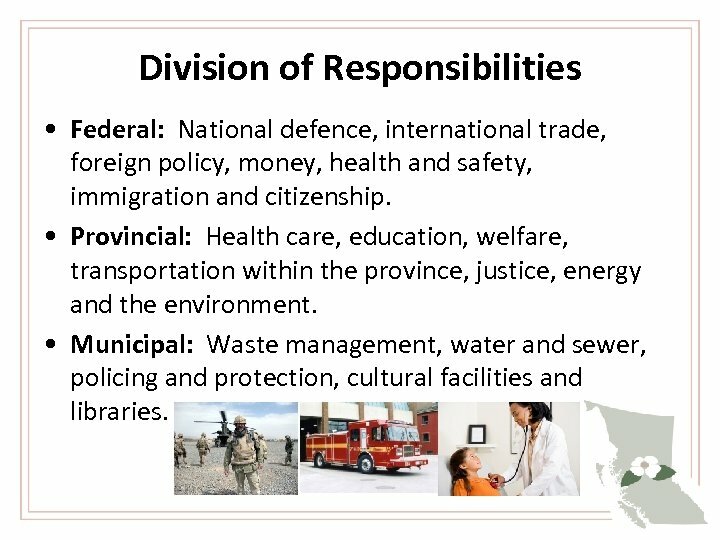 Division of Responsibilities • Federal: National defence, international trade, foreign policy, money, health and safety, immigration and citizenship. • Provincial: Health care, education, welfare, transportation within the province, justice, energy and the environment. • Municipal: Waste management, water and sewer, policing and protection, cultural facilities and libraries. 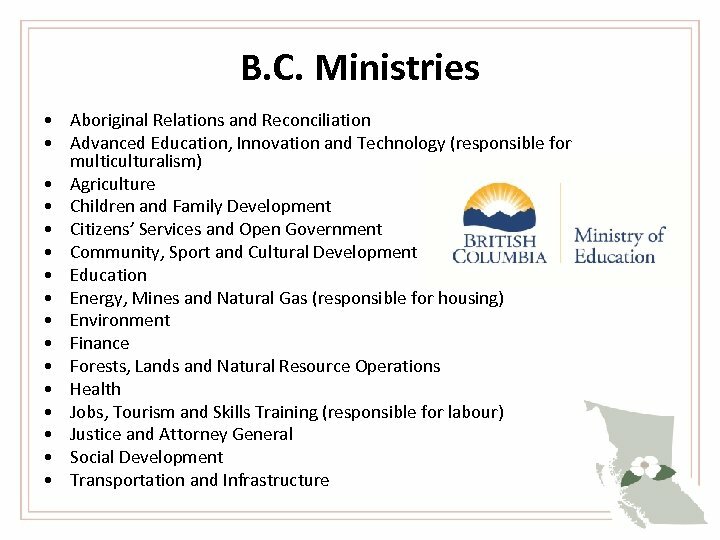 The Government of B. C. • The Government of British Columbia is organized into different departments called ministries. • Each ministry handles one of the government’s responsibilities (e. g. , Ministry of Health, Ministry of Education). • The premier appoints an MLA to be in charge of each ministry. They are called a minister. 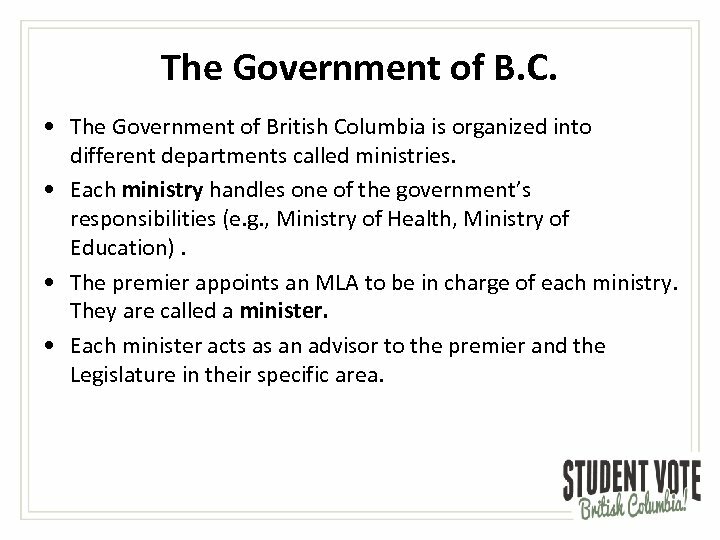 • Each minister acts as an advisor to the premier and the Legislature in their specific area. 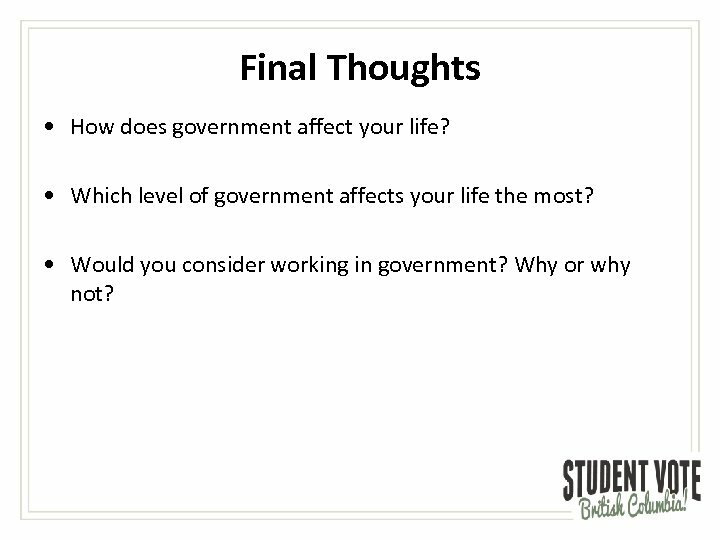 Final Thoughts • How does government affect your life? • Which level of government affects your life the most? • Would you consider working in government? Why or why not?